For some, it will not be possible to separate the movie There Be Dragons from their views about Opus Dei, as it tells the story of that organization’s founder, St. Josemaría Escrivá. The majority of viewers, though — whose only awareness of Opus Dei is the absurd fictional albino killer monk in Dan Brown’s The DaVinci Code — will find an inspiring and moving, if at times melodramatic and muddy, film about forgiveness and the choices people make in tough times. It will be hard to walk away from There Be Dragons without admiring Josemaria. Much of the credit for this compelling portrayal of the future saint goes to British actor Charlie Cox, known for his starring roles in Stardust and Stone of Destiny — the latter a delightful film and one of my favorites of the last few years. (I interviewed Cox about the movie several weeks ago and you can read that conversation here .) 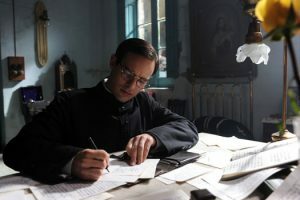 It would have been easy to portray Josemaria as either too pious or too worldly, but Cox and writer/director Roland Joffé strike the right balance, giving the character both human vulnerability and the sense of someone following a divine calling. But, ultimately, the film isn’t even centered on Josemaria. Roland Joffé has said repeatedly that he was drawn to the project because it was a good and inspiring story, and that he was uninterested in the controversy. But Joffé has been attracted to controversial subjects before. His critically acclaimed 1986 film The Mission deals with the Church’s role in colonizing South American native populations, while The Killing Fields looks at the Khmer Rouge in 1970s Cambodia. And it seems to be with epic stories and foreign locales like these two and City of God that Joffé shines. He has struggled to find that winning formula for over a decade and with There Be Dragons he is back in form. One of my first thoughts about There Be Dragons, though, was that it does not feel like a Hollywood movie — not primarily because of the Spanish locations and accents, but rather the slightly heavy-handed melodramatic style, epic scope and use of almost gimmicky devices. In one scene, for example, we see the two young boys, Josemaria and his fictional friend Minolo, who are to have profoundly different perspectives on life, through the two lenses of a pair of reading glasses laying on a desk, reminiscent of the opening scene of Joffé’s City of God, which was shot through a mixture of glass and reflections. There Be Dragons does not feel like a Hollywood movie — not primarily because of the Spanish locations and accents, but rather the slightly heavy-handed melodramatic style, epic scope and use of almost gimmicky devices. But sit through this schmaltz, because once you get into the story, the film comes alive. Lovers of the craft of filmmaking may be amused or impressed by some of these flourishes. For me they were sometimes moving, but often distracting. Most notably, there’s an axiom that if a movie begins with voiceover narration, run away. Not only does this film begin with narration; one of the characters introduced by the narrator begins narrating himself, this as the prelude to flashbacks that take us (finally) to the main story. Joffé opened both The Killing Fields and The Mission with narration as well. I’m sure Joffé worried at a present-day viewer seeing the relevance of an historical drama and believed a modern character’s perspective would make it more accessible and interesting. I’m sure he also felt the need to frame the story for the viewer, explaining the setting of 1930s Spain. But these are things that could and should have been done through storytelling within the main story’s time and place. I found both the (two layers of) voiceover narration and the flashback setup distracting, and, as artistic devices, strained. But sit through this schmaltz, because once you get into the story, the film comes alive. At around the film’s halfway point, we shift gears from this interesting story about the life of a saint to the Spanish Civil War battlefield. All three plots, Josemaria’s, Minolo’s, and the 1980s father and son wrapper, eventually tie back together, but the effect is of another movie taking over. A second theme is the choices we make, especially in tough times, and how they affect the trajectories of our lives. Both Josemaria and Minolo face hardship and tragedy, as children and as adults. After Minolo’s father dies, Fr. Josemaria visits his old friend and encourages him to use his suffering to go deeper and find his dependence on God, as he has done. Minolo spits back, “Suffering has no purpose.” Instead, he becomes more and more bitter and jealous. In our conversation with Charlie Cox , he said he hoped the viewer would see some of themselves in each characters, adding, “You’ll hopefully ask yourself, when faced with adversity, which of these characters do I tend to turn to?” Of his character Minolo, Wes Bentley told us, “He didn’t know who he was at all, and in that confusion was the basis of anger.” This contrasts starkly with strength of character, which Cox says he was told repeatedly was Josemaria’s primary characteristic. At around the film’s halfway point, we shift gears from this interesting story about the life of a saint to the Spanish Civil War battlefield, picking up Minolo’s role in the fighting, as Josemaria’s escape from Spain becomes a minor element. The remainder is basically a war movie with new characters and little relationship to the first half of the film. All three plots, Josemaria’s, Minolo’s, and the 1980s father and son wrapper, eventually tie back together, but the effect is of another movie taking over. My own taste would have been for a smaller film about Josemaria’s early life, without narration, flashbacks and Spanish Civil War battle action — just two hours about how this future saint built what he built and became who he became. But then that movie would not have been made with a Hollywood budget. Wes Bentley (American Beauty) delivers a solid performance as Minolo past, though the old-man makeup job for his scenes as 1980s Minolo left me unconvinced. Brazilian leading man Rodrigo Santoro (300, Che) and Olga Kurylenko (Quantum of Solace) are appropriately melodramatic and beautiful in their roles as the rebel leader and love interest during the war scenes. And a small bright spot in the modern-day portion is Iranian star Golshifteh Farahani (Body of Lies, About Elly). My own taste would have been for a smaller film about Josemaria’s early life, without narration, flashbacks and Spanish Civil War battle action — just two hours about how this future saint built what he built and became who he became. But then that movie would not have been made with a Hollywood budget. While flawed, There Be Dragons is an engaging exploration of human weakness and strength, and a glimpse into the early life of a modern saint, packaged in a way that gives it hope to be a hit movie. Some will be drawn more to the life of Josemaria, some to the father and son story, some to the best friends turned sour, while others will enjoy the war story; most will walk away satisfied, though none, perhaps, entirely so. Great review and an inspiring film. Saint Josemar√≠a, pray for us! Pray for the Catholic Church!